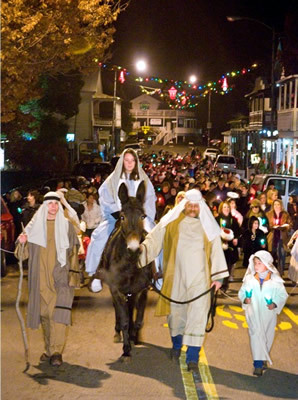 Historic Sutter Creek has brought a contemporary one-night version of Las Posadas, a festive Christmas tradition, to life in a heartwarming evening. Join Joseph and Mary on her burro as they make their way through town looking for shelter. This beautiful candlelight procession will wind its’ way from the Immaculate Conception Church, down Spanish Street, then continue along Main Street where it will end at the stable in front of the Historic Methodist Church. Everyone is invited to join in the procession, singing familiar Christmas carols and listening to the narration of this ancient story. There will be cookies and hot beverages in the social hall following Las Posadas. ANY child who wishes to participate as a character in the drama may do so as a shepherd, angel, or animal (or bring a stuffed animal). Meet at the Immaculate Conception Church (Spanish and Amelia Streets) at 6:00pm for a candle and a song booklet. Dress warmly and wear comfortable walking shoes to enjoy this unique experience in a beautiful Gold Country town.